People on the east coast of the U.S., particularly New Yorkers and New Jerseyans, have a lot more pressing concerns right now than gadget sales or tech companies’ supply chains. However, one big question facing a lot of businesses right now in the northeast is how fast they can get their delivery networks up and stores opened for business in the wake of the natural disaster that took out power for many, and flooded roads, buildings and data centers earlier this week. For Apple(s AAPL), its test comes Friday. November 2 is the first day that Apple’s new iPad mini and updated iPad go on sale in the U.S. and several other countries. While it will be business as usual in most of the 250 Apple stores in the U.S. and nearly 150 in other countries, that’s not the case in New York City and parts of New Jersey: two NYC stores, the SoHo and West 14th Street locations, are closed due to Superstorm Sandy’s effects, and three stores in New Jersey are also shuttered until further notice, according to Apple’s website. It’s hard to predict what kind of effect the store closures will have on sales, but it’s at least one new factor that could impact the all-important first-weekend of sales of Apple’s latest device. Apple will often announce new hardware sales figures from the first weekend to reinforce for potential customers that the device is popular and worth buying, and as a signal to Wall Street what kind of quarter the company is in for. 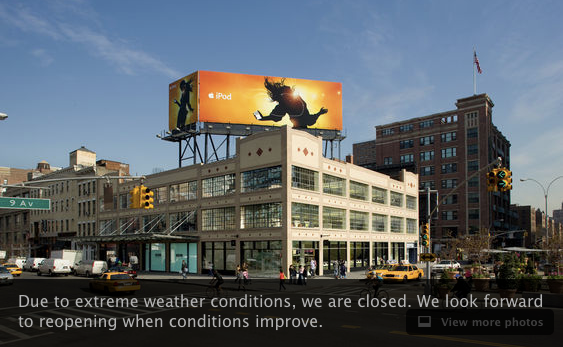 The W. 14th Street Apple Store is closed. Its neighborhood, along with most of Lower Manhattan still has no power. Most of Apple’s other stores in the region do remain open. But some of its most trafficked retail stores in the world, like the Fifth Avenue “cube” store that’s filled with shoppers 24/7, are in Manhattan. Transportation into and out of the city — whether via car, bus, train, subway, airplane or boat — is severely restricted for locals and tourists due to flooding and power outages. And within the city, much of the public transit system is still offline or overtaxed. So instead of plotting the best time to line up to buy an iPad on the first day it’s available, NYC locals are more likely going to be figuring out the best time to get in line for a bus that will get them somewhere near their workplace. True, some people will buy an Apple device automatically and can order online. But in this case, being able to check out the iPad mini in person is going to be necessary for a lot of customers. As the owner of a standard-sized iPad, I myself was skeptical of the iPad mini. How could a smaller, cheaper version of what I have be attractive? Then I got to hold one at the press event last week, and I can tell you, picking it up and playing with it definitely helps you make a decision. Most people are going to want to see that screen for themselves. The other factor — people getting their preordered iPads in the mail — is another challenge Apple is going to have to deal with, and it’s going to affect even more people than store closures. FedEx, which Apple uses, is warning customers that deliveries are indefinitely delayed or just slow for most of the northeast, as BGR noted earlier. In the long run, this disaster probably won’t have a significant effect on Apple’s overall quarterly sales of the iPad mini and new iPad. Both devices are launching globally and will be rolled out to many cities and towns all over the world where shopping will continue as normal. Plus, we’re in that time of year where a lot of people go gift shopping. So while Sandy was certainly powerful, she didn’t cancel the holidays. Jeez what happened to you hair. Like young men selling you apple products?